Recommended book for a beginner? Thread: Recommended book for a beginner? Since this is my first post, I'll introduce myself a little before I ask my question. I grew up watching my mother sew, and even made a couple of little bags with her. That was a long time ago, and I have decided to start anew. I have always enjoyed making things, and since my daughter was born I have had the urge to start sewing again. 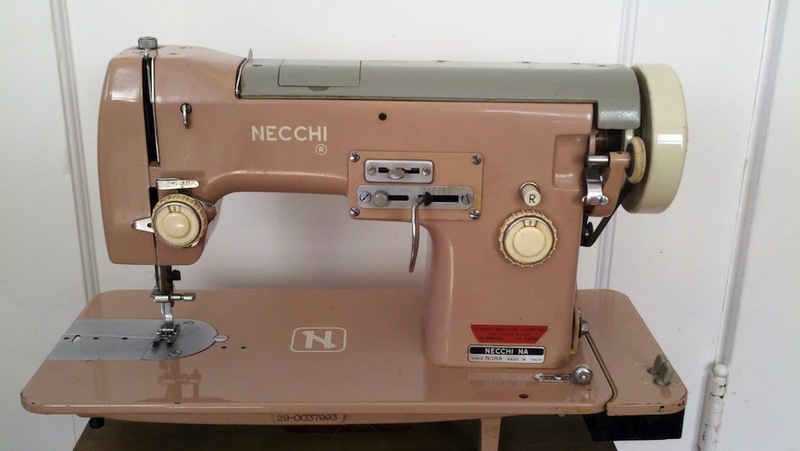 I bought a beautiful older Necchi Nora machine off of craigslist that just needed a little TLC. Well, maybe not a little. I spent an entire weekend with some rubbing alcohol, Q-tips, and a blow drier loosening up all the crusted old oil. The machine came with all the cams and accessories, and runs smooth as silk now. I couldn't be happier with the machine. The problem is the operator. I don't remember a thing about sewing. I can set the tension, and thread the machine. What I don't know is what to set the tension to, or what needles I should be using for different fabrics, or what stitches/thread would be best for silk, or webbing, etc. Does anyone have a book recommendation that covers these technical aspects of sewing?? Here is a picture of the actual machine I got off of craigslist before I cleaned her up. I will post the cleaned pictures when I get home. Kudos to you for getting the machine running! Superior threads website has lots of information on thread. For Christmas in 1999 Jim gave me a book called "Quilter's Complete Guide". It is packed with information on all aspects of quilting, from tools, to hand quilting. It is by Fons and Porter. Thank you. I will be ordering this. Thanks for the kudos. It was actually a lot more work than I thought it would be. If it wasn't for the blow drier, I never would have gotten some parts unstuck. The heat really helps loosen the old oil, however, I didn't discover this until the second day. Last edited by charkilah; 05-19-2013 at 01:21 PM. Kay, thank you. you're right, they have a lot of information. I will start wading through their website. Anne, that looks like a great book. The reviews are very positive. That is now at the top of my list. Thank you. Great job on the machine! Once you learn about your machine have fun!! Cant wait to se your first quit !! Wow, my Mom had a Necchi in 1958 that looked very much like this one. It was a great machine. I have Quilting For Dummys and it has a lot of information in it about every aspect of quilting. And that about sums up my knowledge of either. I didn't know the terms had different meanings. I will check out the better homes and gardens guide. Thank you. I am hoping to make a quilt for my daughter as my first project, but I would like to tackle other types of projects as well. Quilting for Dummy's sounds like a good place to start. I will stop by a barnes and nobles and look it over. thank you everyone for such quick responses. I highly recommend the books by Harriet Hargrave called Quilter's Academy. Book 1 started with the basics, wash vs no wash, cutting, etc. There will be 6 books altogether. Good luck with your sewing adventure. Lucky you to get the Necchi! It's a beautiful machine. I have the Necchi Supernova. Got it new about 50 years ago, and it is still my primary machine. I couldn't find a walking foot for it, so use my Elna when I need the walking foot, but the Necchi is still my go to machine. Hope you enjoy yours as much as I have mine! Quilts! Quilts! Quilts! is also an excellent book! Also "It's Okay if You Sit on My Quilt Book" by Mary Ellen Hopkins. I like her 'adaptable'/practical' approach to making things. Sewing/quilting - both seem to require a needle and thread to attach pieces of fabric together! There are also some nice Singer books on sewing. I would recommend the quilting book listed above. If you want to make bra's : Anne St. Clair from Needle Nook has a great book. Also - Use the internet- lots and lots and lots of information. To start with- sew on a piece of paper or paper towel to get the hang of moving your hands. Draw a line and see if you can follow it. Figure out where a 1/4" scant seem is on your machine, and mark it for quilting. You may also want to look for some tutorials on YouTube. I've been quilting or years, but I absolutely love Jenny Doan from the Missouri Star Quilt Company. She uploads a new tutorial every week. I have probably made at least a dozen quilts from her videos. Her early tutorials cover a lot of the basics, so you may want to start there. Most of her tutorials are less than 10 minutes, so they are not a major time commitment for you. I must admit, I've watched many of her tutorials more than once just for the entertainment value they hold! Be sure to post a pic of your first project! Seems to be a great resource for everything sewing! After you sign up for the free account they actually give you some beginner sewing tutorial videos. Hope this helped. I learned a lot from all kinds of YouTube videos. I also have a few books. "Quilting 101, A Beginner's Guide to Quilting" is a good book. I use Albris.com to find used books. Blogs written by quilters and sewers are also a great source for inspiration and tutorials. Have fun. My go-to book is Better Homes and Gardens "Complete Guide to Quilting". It even has special instructions for south paws, practice grid sheets and is the best one I have run across. this is my favorite go-to quilting book too. also suggest looking at videos on YouTube and checking out www.nancyzieman.com. She does all kinds of things and her videos are free to watch. Same with Quilt in A day. All of Eleanor Burns are free to watch. When I started quilting there were a few quilting shows on the public TV station.... usually Saturday morning. I would tape them and watch them over and over. I go to a craft day at my SIL's house about once a month and the ladies there are always saying that I know all the slick tricks. I learned them all watching those quilting shows..... look through your guide. Different cities have different offerings but I still watch the ones that are still being broadcast. There are always some good suggestions to help your quilting go better. I really like Carol Doak's "Your First Quilt Book (or it should be)". After borrowing it from the library a few times, I finally went to Amazon and bought my own copy. Love it! I'm with Maureen - seeing this was a trip down memory lane with my dear Aunt Betty. Thank you for that memory. Welcome from SW Arkansas. I love your pink sewing machine. I learned to sew when I had my first baby (51 years ago). I made her clothes and window curtains. Since then, I've made slipcovers, window treatments, more clothes and now learning to quilt. I think sewing is not only fun but also it allows you to customize your clothes and decorating style. Don't give up on it. You have come to the right place to get tons of help and encouragement. Looking forward to seeing your first project.